Ben Nye's Glam Shadow Palette adds beauty with ease to create one of the most adaptable palettes! Twelve totally versatile, totally wearable colors including an eye-popping jewel-toned blue in Twilight Blue! Enhance eyebrows, contour face and eyes, highlight cheekbones and brow bones, create the perfect smokey eye or dip a moistened brush into these colors to transform any of them into a cake liner! Warm Brownberry and Eggplant make everything from blue to hazel and brown eyes "pop," while several warm browns and cool grays accent and define in colors suitable for bridal, special occasion, or just any occasion! This palette is even refillable! Size: 1.44oz / 42gm. Yield 400-750 applications. Talc; Zinc Starate; Caprylic/Capric Triglyceride; Octdodecanol; Isopropyl Palmitate; Dimethicone; Lauroyl Lusine; Nylon-12; Silica; Cyclomethicone; Tocopheryl (Vit. E) Acetate; Phenoxyetthanol; Methylparaben; Propylparaben; Butylparaben ; Polysorbate 20. May Contain(+/-): C NO 77019; 77489;77491; 77492; 77499; 75470; 77007; 77742; 77289; 19140; 77288; 73360; 15850; 15985 (Mica; Bismuth Oxychloride; Titanium Dioxide; Iron Oxides; Carmine; Ultramarines; Manganese Violet; Chromium Hydroxide Green; Red 30; Red 7; red 6; Yellow 6); Parfum Free. I was a little hesitant first in purchasing this expensive palette. It is a little on the pricey side but the eyeshadow pans are HUGE! They are about the size of a Makeup Forever single shadow. I was a little disappointed in the pink and burgundy shade, the pink is more like a warm darkish beige an the burgundy is a little reddish brown. The blue is amazing!!! all the other colors are perfect for creating whatever look you are going for. I find myself reaching for this palette very often. Perfect delivery at home, all my products in perfect condition!! 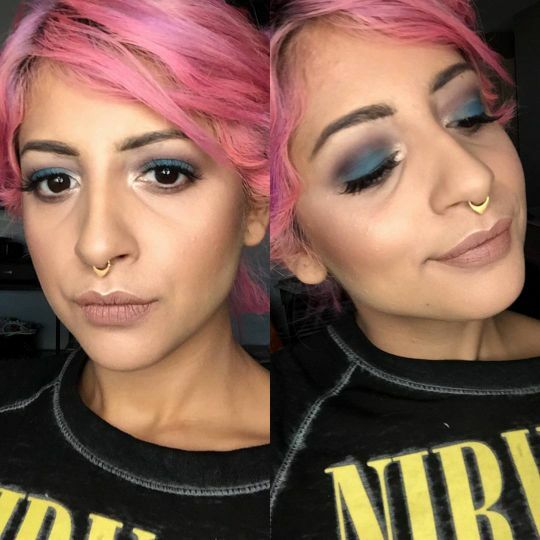 Cinthia S. Reviewed by Cinthia S.
I initially noticed kandee Johnson use this palette to create so many different looks. I decided to try them since they came out to be so cost effective and have all the colors I normally gravitate towards. No disappointment at all. It's going to last forever seems like because the pans are huge. Glad I invested.